This set of illustrations adorns the packaging for a mineral water named “HanShuiXiGu”. The water originates from the area around the Qinling Mountains in Shaanxi Province, China, which is famous for the uniqueness and excellence of its ecological environment and water quality. The mountains are also home to the remarkable “Four Treasures of Qinling”, which are all endangered species: the panda, crested ibis, golden monkey and antelope. For each of the four package versions, an animal has been created and printed on the obverse side together with the product information. On the reverse side, the terrain features of the Qinling Mountains are combined with the appearance of the “Four Treasures” in freehand sketches to present a group of unique visual signs. On closer inspection, each of the four animals also forms an interesting, multifaceted landscape, enhanced by a special feature that enlarges the sketches when the transparent PET bottle is filled with water, allowing consumers to identify every single detail of the image and thus get a deep impression of the product. The illustrations for a mineral water packaging impress with its high craftsmanship. 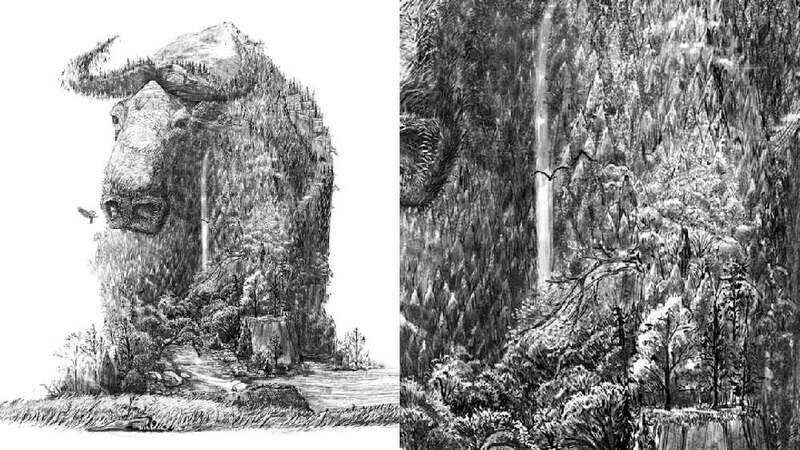 The idea to let an enlarged image of an animal emerge out of the details of nature has been perfectly implemented. Convincing, above all, is the fact that and the way how it establishes a local reference. The consumer can immediately see – ingeniously enlarged by the water itself inside the bottle – where it comes from.